much in the last fifty years. eral liners advertising The Ago. for Red. Cross Drug Store, Ed W.
Lumber Co., C. Ganahl Lumber Co..
lady who sponsored the medicine. of January 20. 1900:	Who	she was. offered for public sale in drug stores." practically out of the prints. the stick full of type was “dumped"
time to humor your curiosity. tween Los Angeles and Salt Lake City. hour a day employee as caretaker. ing flat on her back with a crash. were the first ones to reach the scene. by his safety belt hanging head down. fields whatever, both were lost. badly injured had survived the crash. a fatality or a serious accident. people cross the Atlantic every night. Honolulu and thence to the Orient. 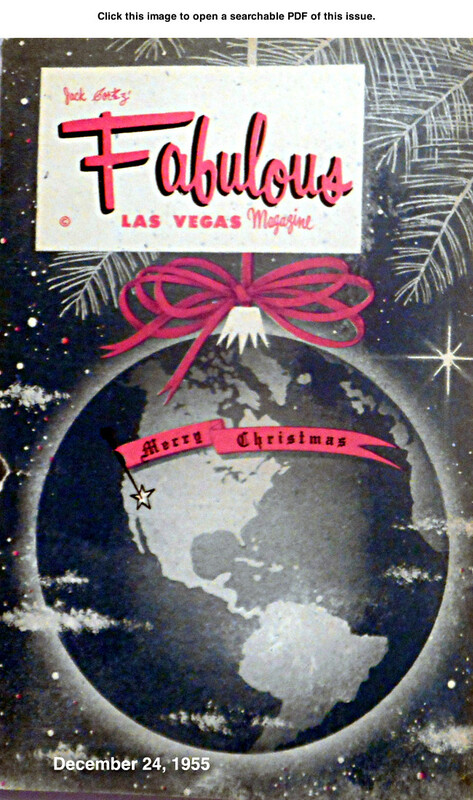 The Christmas issues of Fabulous Las Vegas magazine were huge. 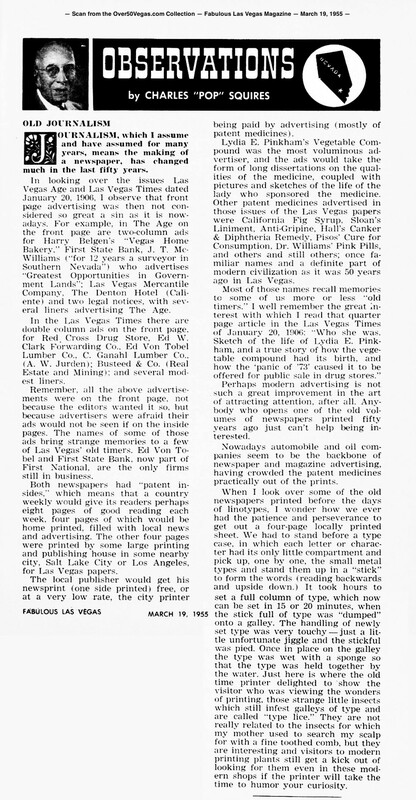 The December 24, 1955 issue below was over 300 pages. I've scanned and made searchable 116 of those pages. the Jack Cortez "That's For Sure" column for the entire year. It also has great advertisements and Christmas greetings from all the casinos and celebrities who were in Las Vegas at the time. Click on the image below and it will open as a PDF in a separate window on your computer. It's a very large column and may take a little while to open.